There are 23 Assisted Living Facilities in the Vernon Hills area, with 4 in Vernon Hills and 19 nearby. The average cost of assisted living in Vernon Hills is $4,847 per month. This is higher than the national median of $3,346. Cheaper nearby regions include Long Grove with an average starting cost of $4,647. To help you with your search, browse the 155 reviews below for assisted living facilities in Vernon Hills. On average, consumers rate assisted living in Vernon Hills 4.3 out of 5 stars. Better rated regions include Long Grove with an average rating of 5.0 out of 5 stars. Caring.com has helped thousands of families find high-quality senior care. To speak with one of our Family Advisors about assisted living options and costs in Vernon Hills, call (855) 863-8283. A suburb of Chicago, Vernon Hills is located in Lake County, Illinois. It is home to four assisted living facilities with a further 24 located within proximity to its borders. These facilities are licensed and regulated by the Division of Assisted Living, a branch of the Illinois Department of Health. The area’s assisted living facilities provide seniors with a comfortable place to reside while providing assistance with activities associated with daily living. The Vernon Hills Senior Center is designed for seniors who are 55 and older. It features a meeting place, a kitchen area, pool tables, television, library and book club, dance classes and fitness classes. The suburb of Vernon Hills is home to world-class medical facilities, including nearby NorthShore Medical Group, in the event of medical emergencies or illness. Seniors who rely on public transportation in Vernon Hills are served by PACE Bus, which also offers paratransit programs. Seniors can ride the bus at a reduced fare. In addition, Vernon Hills features a senior shuttle and dial-a-ride services. Seniors who value community safety will be pleased to note that Vernon Hills has a low annual crime rate of 1,494, which is well under the national crime rate of 2,837 per 100,000 people. The cost of living in Vernon Hills is well above the national average index. That index in Vernon Hills is 126; the national average is based at 100. Seniors living on a fixed income should take note of this statistic. With an average July high of 82 degrees, Vernon Hills summers are frequently hot and humid. When the heat index is high, seniors with respiratory issues may be advised to stay indoors. The area’s winters are more extreme, however, with inclement weather that could include heavy snowfall and icy conditions. The January average temperature is 12 degrees. Assisted Living costs in Vernon Hills start around $4,847 per month on average, while the nationwide average cost of assisted living is $4,000 per month, according to the latest figures from Genworth’s Cost of Care Survey. It’s important to note that assisted living rates in Vernon Hills and the surrounding suburbs can vary widely based on factors such as location, the level of care needed, apartment size and the types of amenities offered at each community. Vernon Hills seniors who meet eligibility requirements may qualify for financial assistance to pay for care in an Illinois assisted living facility. The Supportive Living Program is a Medicaid waiver program that may be used to pay for care available in an assisted living facility. 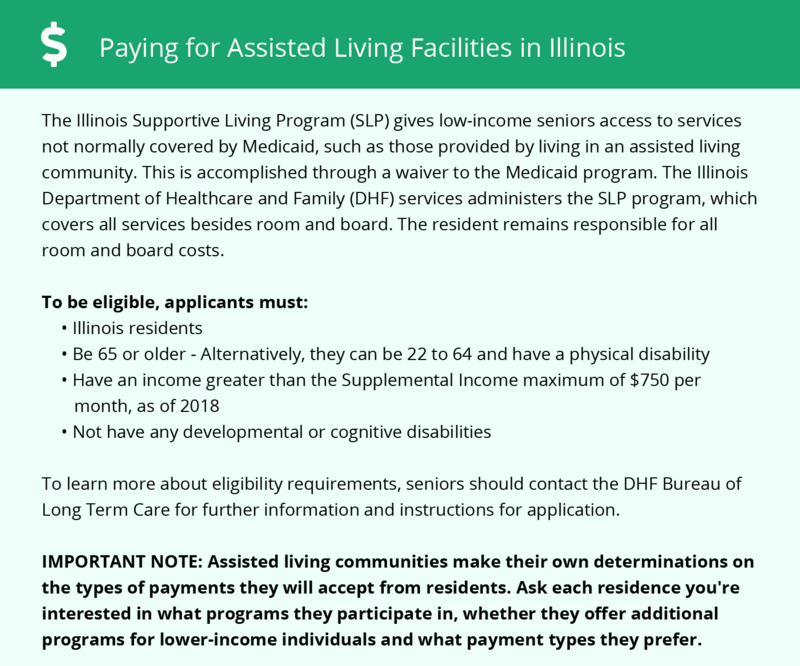 In addition, the Illinois Medicaid-Medicare Alignment Initiative is offered to eligible seniors and disabled people who reside in Lake County to help pay for assisted living care. To see a list of free assisted living resources in Vernon Hills, please visit our Assisted Living in Illinois page. Vernon Hills-area assisted living communities must adhere to the comprehensive set of state laws and regulations that all assisted living communities in Illinois are required to follow. Visit our Assisted Living in Illinois page for more information about these laws.